The French philosopher and mathematician René Descartes is well known, but how many people have heard of Helena Jans van der Strom? Helena was in a relationship with Descartes for over a decade and played an important role in his life, yet she has been given little attention by historians and the information we have about her is very limited. 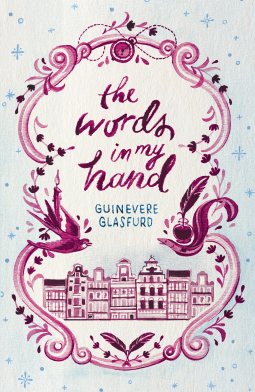 In The Words in My Hand, Guinevere Glasfurd attempts to redress the balance and gives Helena a voice, building a fictional story around the known facts. Mr Sergeant had paper, but if I was caught with any of that I would be dismissed. I could not take it without asking. And if I asked, he’d want to know why, what I wanted it for. What would I say? Some excitement comes into Helena’s life one day in 1634 when Mr Sergeant takes in a new lodger – René Descartes, whom Helena thinks of only as the Monsieur. Getting to know the Monsieur is not easy as he is fiercely guarded by his valet, the Limousin (who takes his name from his place of birth), but eventually he and Helena become friends – and then something more than friends. The Words in My Hand explores the relationship between Helena and Descartes, suggesting possible answers to the many questions that arise. What qualities did Helena have that made her attractive to Descartes? What did they teach other and learn from each other? What was the significance of the role she played in his life and he in hers? It is often a difficult relationship and not a very equal one either – it can’t be, because of their very different positions in society. It’s obvious that Descartes cares about Helena, but he is reluctant to give her the sort of conventional family life she would like, so she accepts what he is prepared to offer instead. She refers to him throughout the entire novel as the Monsieur and never as René, which says a lot about the barriers between them which are never quite broken down. It’s not a particularly romantic love affair and Helena deserves something better, but it feels realistic for the time period. Other characters are pulled into Helena’s story too including Betje, a fellow maid whom she befriends and tries to introduce to the joys of reading and writing. I was particularly intrigued by the uneasy interactions between Helena and the Limousin, Descartes’ valet. And of course, I should mention the setting – I often seem to be drawn to historical fiction set in the Netherlands and I thought Guinevere Glasfurd captured the atmosphere of the time and place very well. I really enjoyed this book (despite feeling annoyed with Descartes at times); it was published in 2016 and is Guinevere Glasfurd’s only novel so far, but I hope she is going to write more. There are too many interesting women in history that haven’t been given the attention they deserve! Yes, definitely! I’m glad some of them are being given a voice at last through books like this one. Interesting setting with interesting subjects in this novel. It resembles somewhat Girl with A Pearl Earring, perhaps? I mean, taking into account the differences between both historical figures–one being a painter, another a philosopher. It is a similar story, although the kind of relationship Helena has with Descartes is quite different to the one in Girl with a Pearl Earring. I liked both books, but I think I preferred this one. Interesting premise. I did like the title too, very intriguing. Yes, it’s an interesting title. That’s what drew me to this book before I even knew what it was about. Hmmm, not sure about this one. I suspect that affairs with maids were fairly common back then. Yes, probably. Helena’s affair with Descartes lasted a long time, though – ten years or more. Yes, it has always seemed odd to me too. Helena doesn’t even call Rene Mr Descartes…just ‘Monsieur’! I usually seem to enjoy books with Dutch settings. I think The Miniaturist would be a good book club choice, with lots to discuss.